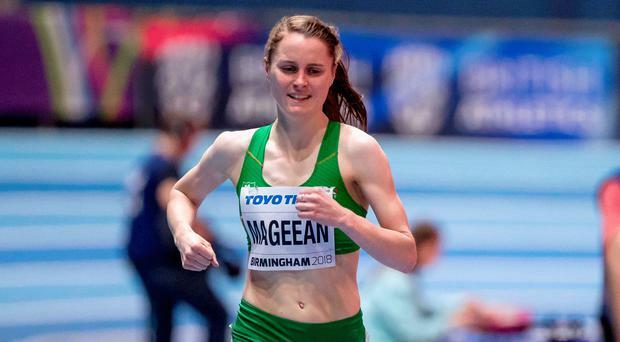 Ciara Mageean showcased her credentials as a medal contender for the European Indoors in Glasgow next month by setting a new Irish Indoor 1500m record in Athlone last night. The Portaferry runner took nearly two seconds off her own record time, completing the race in four minutes and 6.76 seconds while holding off a strong challenge from Romanian Claudia Bobocea. It's the 26-year-old’s second Irish record of the Indoor season. At the New Balance Indoor Grand Prix in Boston last month Mageean set a new record of four minutes and 28.31 seconds, beating her own record set three years previous. Elsewhere Letterkenny's Mark English put in a winning performance in the 800m at the AIT International Grand Prix, with a time of one minute and 46.94 seconds.